Prominent Indian politician and leader of the Congress Party Sonia Gandhi has been viciously attacked in a full-page advertisement costing at least $64,575 in today’s edition of the New York Times. The Ad, which we noticed on Page A5 in the Washington DC edition and Page A11 in the Late Edition of the New York Times, compares her most unfavorably with Mahatma Gandhi. 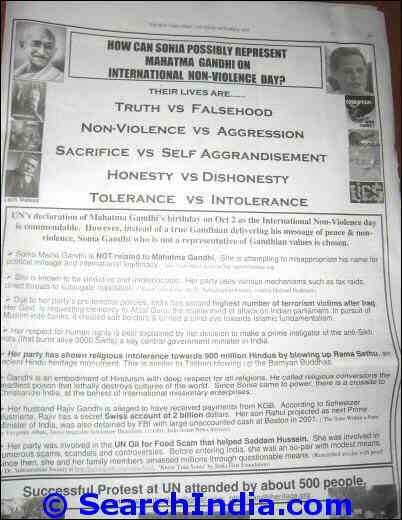 The people behind the Ad seem to be agitated that Sonia Gandhi was invited to deliver a talk on Mahatma Gandhi’s message of peace and non-violence at the United Nations General Assembly on his birthday on October 2. Mahatma Gandhi’s birthday was observed as the International Day of Non-Violence by the U.N. General Assembly. Declaring that Sonia Gandhi “is not a representative of Gandhian values,” the Ad attacks Sonia on multiple fronts: corruption, deception, violence, intolerance, terrorism, self-aggrandizement and religious bias. The New York Times advertisement has been endorsed by the Forum for saving Gandhi’s Heritage consisting of Mahatma Gandhi International Foundation, Mahatma Gandhi Center & Hindu Temple, Indo Caribbean Council, Kashmir Taskforce, Indian American Intellectual Forum and Foundation of Nepalis in India. The Sonia attack Ad must have cost at least $64,575, the so-called standby rate rate for a full page Ad in the New York Times that does not guarantee the date or page on which it will appear. We are skeptical that the advertisers paid the regular full page Ad Rate of $142,083. The choice of Sonia Gandhi to address the U.N. on an important occasion like the International Non-Violence Day has left some NRIs in the U.S. aghast. One long-time Indian resident in New Jersey felt that the Mahatma’s grandson Rajmohan Gandhi or Nelson Mandela would have been better suited to articulate Gandhiji’s vision of non-violence in today’s context. While Sonia Gandhi may or may not be the best person in Indian politics, virtually all political leaders in India – at the Central, State and local levels – are the same. The first generation of Indian leaders lived mostly for politics. They were attracted by the authority they wielded, but also often motivated by a spirit of service and sacrifice. The Indian politicians of the current generation, however, are most likely to enter politics to live off it. They are attracted by power and prestige, and also by the opportunities for financial reward. The lawmakers of India are, more often than not, its most regular lawbreakers. Given the dubious track record of most Indian politicians and parties, we do not think there’s little to distinguish one from the other. If Sonia Gandhi is evil incarnate as the attack ad makes her out to be, most Indian politicians are no different.